The sugar plum fairy and dancing mice are synonymous with Tchaikovsky’s Nutcracker, a classic Christmas ballet (you can read Seesaw’s review of the current West Australian Ballet production here). But at the Quarry Amphitheatre a very different kind of Nutcracker is being performed by the WA Youth Jazz Orchestra. In 1960 the sparkling tunes from Tchaikovsky’s Nutcracker Suite (essentially the highlights reel from the ballet) were arranged for big band by Duke Ellington and Billy Strayhorn. When it comes to big band music you can’t go wrong with the Ellington/Strayhorn combination; their inventive use of the big band in the mid twentieth century elevated jazz to an artform. Their Nutcracker was an inspired choice to close the WA Youth Jazz Orchestra successful 2018 season, a year where they have sold over 8000 tickets, a huge growth from 1500 tickets in 2016. On Thursday night the audience at the beautiful Quarry Amphitheatre settled in for a good night, dodging the occasional rain drop as the moon rose behind the stage. Tchaikovsky’s tunes are whistle-able and instantly recognisable and Ellington and Strayhorn’s arrangements are both fun and moody, fragmenting Tchaikovsky’s melodies between different instruments and colouring with muted brass and Dixeland cacophony. And then there are the harmonies: 19th century romanticism infused with a good dose of blue notes and perfect cadences left suspended midair. 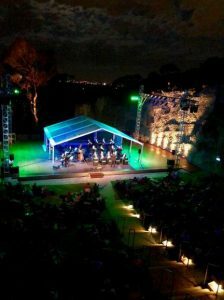 The WA Youth Orchestra performing at the Quarry Amphitheatre. Photo Justine Thornley. When the plush horn section of the Wednesday Night Orchestra started playing the overture theme over a walking bass line it was as though Tchaikovsky had exchanged a crisp dinner suit for a velvet coat and cigar. Led by director Mace Francis the band brought their lush sound and tight groove to the slow shuffle of Toot Toot Tootie Toot (based on Dance of the Reed Pipes), the New Orleans wail of the Sugar Rum Cherry (The Sugar Plum Fairy) and Arabian, Russian and Chinese dances. A highlight was the contributions from WAYJO alumni Ben Clapin on clarinet. But it was a mixed performance. Cracks appeared in the sparser sections revealing tuning and timing issues, and the Arabian dance needed more meticulous rehearsal to enable it to hold together. The first half of the evening featured the energetic band director Marty Pervan leading the Tuesday night orchestra through a set list of Ellington favourites. The band swung hard through Cottontails, Ko-Ko, Take the A Train and Braggin in Brass. Singer Jordan Boase joined the band and his smokey vocals in Rocks in My Bed were a highlight. A footnote: I’m still waiting for the day WAYJO’s Women in Jazz program begins to feed players into the orchestras and balance the gender disparity in the line up. Three women in a 17 piece piece ensemble is a glaring issue; the jazz world is still well behind when it comes to gender parity. Duke Ellington’s Nutcracker concludes November 23 at the Quarry Ampitheatre. 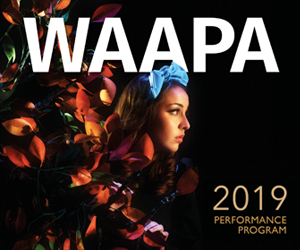 WAYJO’s 2019 season is now available. Picture top: musicians from the WA Youth Jazz Orchestra. Photo Tom Greble.